I wore this outfit to college today and I think this is definitely one of my all time favourite outfits. I got the roll up sleeve top from Primark last week when me and Ally popped in last week and picked up a few bits. It's one of the easiest tops to style and I love that it goes well with both skirts and trousers. I know Topshop do them and they're just a little pricier. I love the fact that it was only £3.50. So worth it and I really love the material of it. Just as I was getting ready to leave Primark last week I saw a neon pink one which I'll definitely have to pick up when I'm next there. Neons are my favourite in summer. I got this cute flower skirt yesterday from Shekinah. It's so fun when one of your friends has a clear out and they always ask whether any of you want anything. ;) I think it goes so well with the white top. As the skirt has flowers on it, you really don't need to go overboard with what you choose to pair it with. A plain top really does go nicely. Just before we left this morning Ally said I could borrow her necklace as it goes quite well in this outfit. I've seen so many bloggers with the same one and they always look so pretty on! 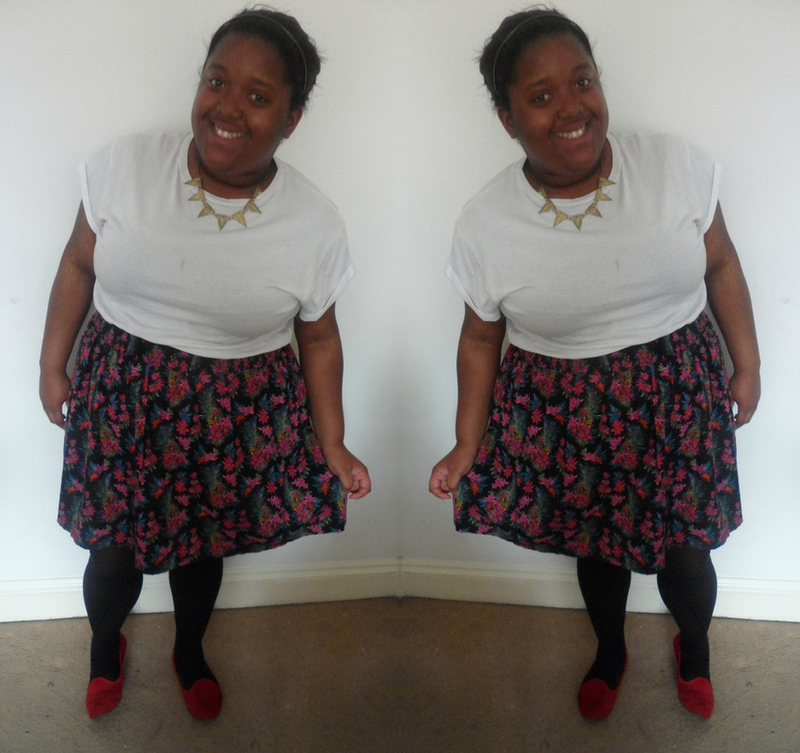 lastly, I decided to top my outfit off with my favourite £2 red flats from Primark. They are so comfy and I really want Primark to start doing them in different colours, I'd totally buy them all! What do you think of my outfit? anyone else really loving roll up sleeve tops? Song In Title: Ke$ha - Animal. I really do. ;) Thank you lovely, I really love the flowers on it! I just purchased one of the roll sleeve tops too! Absoloute bargain, and gorgeous outfit. Total bargain. :D I literally need to pick up all the other colours too. Thank you Jilly!